The land on which the borough of Cleona is situated was part of a 1741 land grant from William Penn to John Kreider, a Swiss-German Mennonite who emigrated from Germany. The land, a part of North Lebanon Township, remained in the Kreider family until 1883. In that year, Henry Lentz Long of North Cornwall Township, Lebanon County and William L. Kreider, Londonderry Township, Lebanon County purchased four (4) acres of farmland from Michael K. Kreider and wife Sarah. In succeeding years and now in partnership with his son, John Henry, additional farmlands were purchased from Michael Kreider totaling 138 acres. At present this land comprises the north side of Cleona which has been developed as well as the farmlands and buildings north of the Pennsylvania and Reading Railroad. 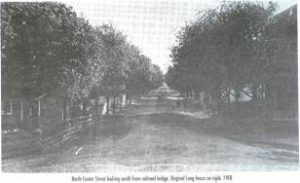 The first building (see photo to left) was a warehouse built by the Longs on the original four acre purchase of farmland in 1883 which became the nucleus of the town of Cleona. This warehouse provided building supplies, coal, and feed for animals for the surrounding area. In 1922, it became the John H. Long and Sons Lumber Company, continuing to supply lumber for the building trades to the growing community. This building, located on the north side of West Pine Street, is at present used for storage. In 1890, John H. Long built the first house in Cleona on the southwest corner of what is now North Center and West Pine Streets in which he and his wife, Fannie Kettering Long, began to rear their family. Their first child, Virgie Cleona (1890-1892) was the first child born in Cleona. This house is still a residence today. The Michael Kreider farmlands containing the house, barn and other out-buildings were purchased in 1901 by the Longs. 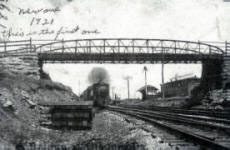 This farm, located north of the Pennsylvania and Reading Railroad, was never developed, but was owned and operated by Henry L. Long until his death in 1923, at which time his son, John H. began operation. From 1930-37 the farm was tenanted by the Henry Dourte family and from 1937 through the early 1940’s by the Victor Hoffer family. Eventually, the farm passed to Mary Long Bowman, wife of Ammon Bowman whose son J. Alfred and wife, E. Fay Ginder Bowman, began operation. This beautiful, productive farm is still operated by them at the present time. On the farm located in a field to the east of North Center Street extension is the Kreider family cemetery. The cemetery plot is enclosed with a substantial iron fence and measures approximately 20 x 42 feet. It contains about 17 burials from 1805 to 1866, all Kreiders except two, a Daily and an Elliot. There are two rows of graves running north and south, one row adults, one row children, mostly with German inscriptions. In 1928, in partnership with his son, John C. Long, J. H. Long with George Darkes and John C. Houck purchased a 160 acre tract of farmland south of U. S. Route 422 (Penn Avenue-Berks and Dauphin Turnpike) in North Cornwall Township. This land was also planned into city blocks and building lots for the further expansion of Cleona. There was a great sense of community. As early as 1894, a school was established and small businesses began to develop. People took pride in their small town. As it grew, churches were established, businesses continued to multiply, playgrounds were developed, a new school was built to accommodate the growing population, and sports programs were begun. Incorporated into a borough in 1929, Cleona, over the years, has grown from a small town to a borough of more than 2100 citizens.